This Opera Philadelphia co-commission and co-production with the Santa Fe Opera has a lot going for it: first and foremost, Oscar himself, the kind of larger-than-life character that any opera would be delighted to have at its center, but also a strong cast, an excellent conductor, fine orchestral playing, and a handsome physical production on sets that are at once elegant, ingeniously flexible, and powerfully atmospheric. The surrealistic staging of the trial, a jamboree enacted by a cast of toys come to life, is a particularly brilliant touch. In his program note, the celebrated English director John Cox, who is credited jointly with the composer, Theodore Morrison, for the libretto, observes: “The common perception of Oscar Wilde is as a great writer and notorious homosexual. 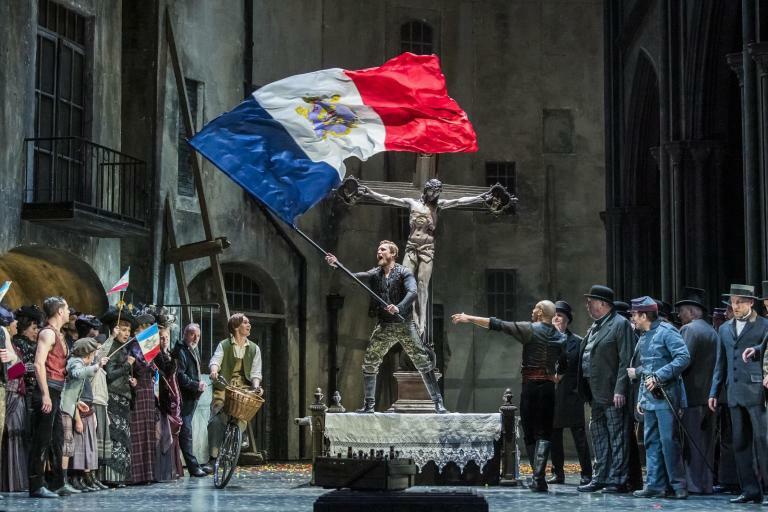 We wish in our opera to accept this duality and modulate it into a perception of him as a tragic hero.” In this aim, the creators of the work have been assisted perhaps a tad fortuitously by the stage persona of David Daniels in the title role. To Cox’s summary of the way Wilde is commonly perceived, I should myself have added to “great writer” his status as a scintillating wit. But though he sings well (especially in the second act, which is musically the stronger of the two), Daniels presents Oscar from the start as a somewhat neutral, even colorless, figure, and this effectively reduces the distance that the story has to travel from purely hypothetical wit to indubitable tragedy. Whenever his devoted and courageous supporter Ada Leverson mentions the expected arrival of another dedicated supporter, Frank Harris, Daniels’s only facial response—under a hair style surely far shorter than any that Oscar might have sported—is a sort of annoyed grimace. Incidentally, it may be worth asking whether the casting of Oscar as a counter-tenor perhaps gives away a regrettably stereotypical response to the challenge of putting a homosexual hero on stage. Despite having never met Mr. Wilde, I have the feeling that he is just as likely to have spoken in tones of rich resonance as in anything like a falsetto. The composer himself has given the story a musical treatment of considerable skill, though I was not bowled over by the vocal writing. One of the crucial aspects of opera is its ability to characterize persons through the lines they are given to sing, but there is little detectable differentiation of vocal manner among all the characters in the opera, whether sympathetic or the reverse. Very often, the last syllable of a line is treated to an efflorescence through several notes, but these phrases have no striking musical point or dramatic impact. Morrison’s word-setting overall seems, in a word, arbitrary. The orchestral part, however, aside from a rather conventional recourse to what sounded like a wood block whenever a specific instance of violence is mentioned, is mostly strong and effective, and composer Morrison and conductor Evan Rogister between them manage it in such a way as to make an unusual proportion of the sung text clearly audible and understandable. To that end, a talented line-up of singers made notable contributions. Heidi Stober was a most attractive Ada Leverson, both vocally and to look at. William Burden was his familiar sterling vocal and dramatic self as Frank Harris, and Dwayne Croft made an impressive Opera Philadelphia debut in the somewhat superfluous Greek-chorus-like role of Walt Whitman. Jarrett Ott and Thomas Shivone brought a welcome touch of human decency to the scene in the prison infirmary. The various bigoted characters who made Wilde’s life hell were all sung and played with conviction, and Wayne Figges, impersonating the sadistic prison governor Colonel Isaacson, even earned a resounding “boo!” from the audience when he took his bow at the end. Bosie, the character who brought Oscar’s world down in ruins, was portrayed by a silent dancer, the resolutely smiling and admirably graceful Reed Luplau. Though the character is obviously quite a few years older, his Bosie reminded me of Tadzio, the insufferable child in Luchino Visconti’s equally insufferable film version of Death in Venice, whose slow head-turnings and seductive smiles provoked in me a strong inclination, if I had happened to have a brick to hand, to hurl it at the screen. Perhaps as grievous as Oscar’s downfall is the sense that his investment of so much devotion and poetry in his love for a person as tawdry as Bosie was a tragedy in itself. But at least the Bosie depicted in this opera, though his behavior had been instrumental in bringing the law down on his lover, remained seemingly loyal to the end.